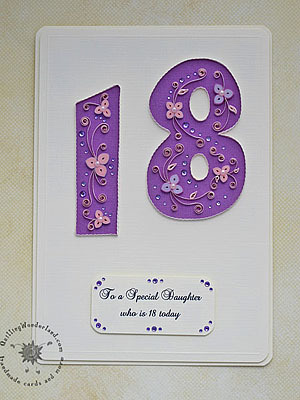 18th Birthday Card - pink and purple floral handmade card with gems. 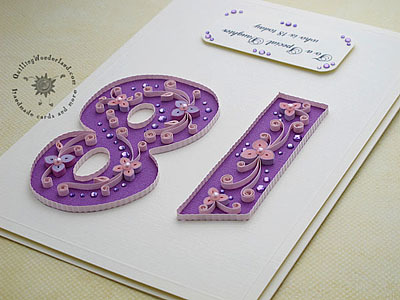 To be honest I never quilled card like this. This was my first time, but it was fun and I could rearrange my floral pattern almost immediately which was great!! So many ideas but finally I had to decide which will be the final one 🙂 It wasn’t an easy decision 😀 At first I was afraid of using so many gems, but at the end they gave this card a nice bling and at first sight you can say that this card is for a special young lady. Hope she liked it! It was a real pleasure to make all these swirls and twirls. Almost forgot this is A5 size card so it’s not that small!! very pretty Iza. I love your swirls and curls . The card is absolutely gorgeous.